In order to meet your quality and service standards you must ensure that your employees work productively in a safe environment. ICC offers a full line of lifting aids to help you succeed. 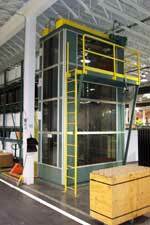 We specialize in lifting aids that are ergonomically correct and functionally efficient at delivering your product to the operator without damage to the product or risk of injury to the worker. Industrial Conveyor Corporation designs and manufactures our own line of vertical reciprocating conveyors.